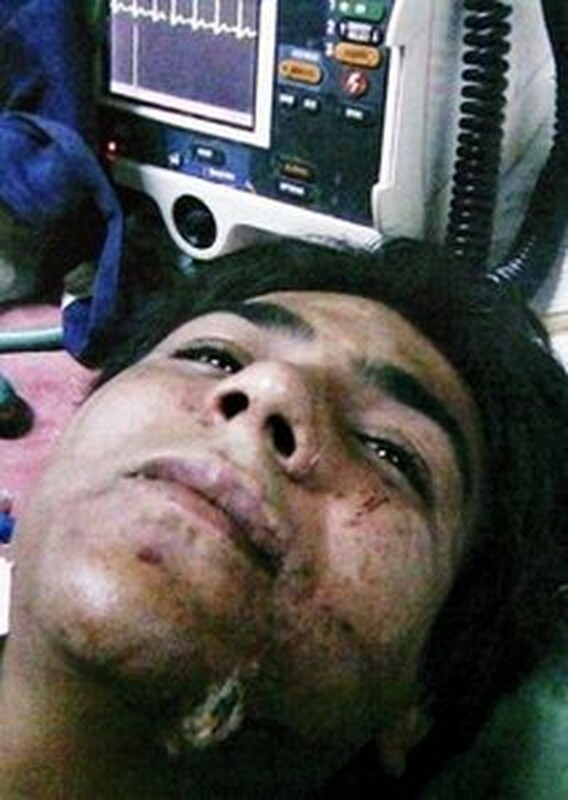 (AFP File) – Mumbai Police-issued photo shows Pakistan national Mohammed Ajmal Kasab on a hospital bed in December. MUMBAI (AFP) – The lone surviving gunman from the 2008 Mumbai attacks was convicted by an Indian court on Monday of murder and waging war against India for his role in the 60-hour siege that left 166 people dead. Pakistani national Mohammed Ajmal Amir Kasab, 22, was found guilty on the most serious charges over the assault that saw 10 gunmen attack three luxury hotels, a restaurant, a Jewish centre and the main CST train station. "You have been found guilty of waging war against India, and killing people at CST, killing government officials and abetting the other nine terrorists," judge M.L. Tahaliyani said as he delivered his verdict. Kasab was convicted on most of the 86 charges against him and faces the death penalty. Dressed in a long white shirt from his native state of Punjab, Kasab stood impassively in the dock in the special prison court as the verdict was announced. Two Indian nationals Fahim Ansari and Sabauddin Ahmed accused of providing logistical support to the gunmen by supplying them with handwritten maps of the city were found not guilty. The widely-expected judgement came after the prosecution said there was "overwhelming" evidence against Kasab, including DNA and fingerprints, security camera footage and photographs showing him with a powerful AK-47 assault rifle. Kasab, a school drop-out, was captured in a photograph walking through Mumbai's train station wearing a backpack and carrying an AK-47 in one of the defining images of the attacks. The former labourer initially denied the charges, then pleaded guilty, before reverting to his original stance and claiming that he was set up by the police and had been in Mumbai only to watch films. Observers expect the judge to hand down the maximum death sentence when a sentence is announced on Tuesday, but a lengthy, possibly open-ended, appeal through the Indian courts is likely. The government officially supports capital punishment for what the Supreme Court in New Delhi has called the "rarest of rare" cases but no execution has been carried out since 2004 and only two since 1998. Decisions are still pending on appeals for clemency to India's president from the killers of former prime minister Rajiv Gandhi in 1991 and Mohammad Afzal, a Kashmiri separatist who attacked the country's parliament in 2001. In his first confession, Kasab admitted to being one of two gunmen who threw grenades and opened fire at unsuspecting rush-hour commuters at Mumbai's main railway station. The railway assault, which killed 52 and wounded more than 100, was the bloodiest episode in the siege, blamed by India on Pakistan-based Islamist extremist group Lashkar-e-Taiba (LeT) and elements in the Pakistani military. Kasab later retracted the confession, saying it was made under police pressure and that he was a victim of mistaken identity. He had earlier alleged torture while in police custody. He and his accomplice also gunned down a number of senior police officers as they fled the station while a home-made bomb they placed in a taxi that took them to the station later exploded, killing the driver and his passenger. In Kasab's home village of Faridkot in Pakistan, many people denied any connection with him, while some sought to justify his attack on the implacable foe across the border. Nuclear armed neighbours India and Pakistan have fought three wars since independence in 1947. "Look, don't blame him. There is nothing wrong if he did it with good intentions against an infidel country like India," said Amjad Ali, a 60-year-old farmer. The trial, which began at a high-security prison court last April, was keenly-watched given the psychological impact of the attacks, which are often compared in India to the September 11, 2001 assault on New York and Washington. The death and destruction in Mumbai came after a series of blasts in Indian cities in 2008 blamed on Islamist extremists. The episode revealed glaring gaps in national security, prompted an expensive upgrade in home security and severely strained diplomatic ties with with Pakistan which are yet to recover. Many Indians, including some lawyers, said the trial should never have taken place, with some calling for Kasab to be hanged without trial.